Select the frequency at which the regular cash flows occurred or will occur. Indicate the beginning time period of the initial investment by selecting the applicable month and entering the 4-digit year. Enter the number of periods you would like included in the outflow/inflow form. Note that if you make changes to this field after creating and/or completing the cash flow entry form, the entry form will be cleared. So feel free to enter more periods than you think you might need as the calculator will simply ignore any extra blank periods. This column will be automatically populated with the time periods based on the selections/entries in the first two lines of the IRR Calculator. Enter the starting investment amount on the first line and then on any subsequent lines where additional amounts were invested (enter as positive values, without dollar signs or commas). Note that numbers entered in this column are usually entered as negative values when using an IRR spreadsheet function, however this IRR Calculator converts the values to negative for you. For time periods where withdrawals occurred, enter the amounts in this column. If no cash flow occurred in an interim time period you can either enter a zero or leave the field blank. You must have at least one value in this column for the IRR calculation to begin. Enter as positive values, without dollar signs or commas. This is the total number of time periods that were included in the calculations. This is the number of secondary iterations (tries) it took to find a rate of return that would support the entered schedule of investments and withdrawals. If this result is equal to 100,000 it means the IRR Calculator reached its limit of tries before finding a solution within +/- $0.05 of a zero balance. This calculator will help you to determine the average annual rate of return on an investment having unequal cash flows that occur on a regular basis. You can choose from Annual, Semi-Annual, Quarterly, or Monthly cash flow intervals, as well as set the date of the beginning time period. Plus, once you choose the cash flow frequency, set the starting time period, and enter the number of periods, the calculator will create a cash flow entry form (spreadsheet) on the fly, filling in all subsequent time periods for you. Cool! Finally, once you have entered all cash flows and clicked the "Calculator IRR" button, the calculator will even generate a printable report showing the future value of each entered cash flow. 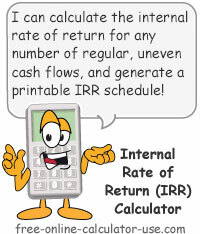 In other words, unlike other online IRR calculators, this calculator won't leave you guessing as to the validity of the internal rate of return result. Note that if you want to calculate the internal rate of return for an investment having non-periodic cash flows, please use the XIRR Calculator instead. Select the interval of the regular cash inflows and outflows. Select the month and enter the 4-digit year of the initial investment. Enter the number of cash flow periods you want included in the cash flow entry form. Enter the starting cash outflow (investment) on the first line of the form and then enter all subsequent outflows and inflows in the periods they occurred (or you expect them to occur). You can skip over any periods where no cash flows occurred. Also, the calculator will interpret the last cash flow entered as the end of the report, regardless of how many periods are included in the form. Once you are satisfied with your cash flow entries, click the "Calculate IRR" button. This will display the internal rate of return, along with a printable year-by-year chart showing the future value of each cash flow. What IRR is and how the function works. IRR stands for Internal Rate of Return and is used to describe the average annual return on investments where deposits and payments vary in amounts. And since the cash flows vary in amounts, standard time value of money formulas cannot be used to solve for the rate of return (they only work for equal cash flow amounts). To calculate the internal rate of return of a series of unequal cash flows (deposits and income), those familiar with spreadsheet software (Excel™, OpenOffice Calc, etc.) can simply use the IRR function to solve for the average annual return of unequal cash flows. However, if you are not familiar with how to set up a spreadsheet to solve for the internal rate of return of a series of unequal cash flows, you can now find a solution using this IRR Calculator -- which has it's own built-in IRR function. The IRR function is an iterative process (algorithm) of trial and error used to find a rate of return that would solve for a schedule of unequal cash flows. Specifically, the IRR function starts with a guess (usually 10%) and calculates the future values of all cash flows based on that guess. If the result is less than the actual combined future values, the function increments the guess by a small fraction of a percentage. And conversely, if the result is greater than the actual future values, the function decrements the guess by a small fraction. Next, in either case, the function recalculates using the new guess. It then repeats the process of adjusting the guess and recalculating until either a result is found, or the preset maximum number of tries (iterations) has been reached. Since the number of iterations required to solve extreme sets of unequal cash flows can be astronomical, I've taken the following steps to limit the amount of time it takes for this online IRR calculator to complete its calculations. Preliminary iteration starts with a guess of -100% and adds 1 percent to the guess until the result is greater than the actual combined future values. Secondary iteration starts with the guess arrived at by the primary iteration and then subtracts .0001 percent from the guess until the result is within $0.05 of the actual combined future values. Maximum number of both the primary and secondary tries (iterations) is set to 100,000. If you would like to see the above limitations relaxed to give a more accurate result, please use the feedback form located beneath the calculator to let me know.